December 2018 – Shop. Learn.  Experience. The Kimono that began my addiction. Stitched from Sew Caroline’s Florence Kimono pattern in an Aztec sweater knit with added fringe. The humble yet classic kimono is a huge star in current fashion and its popularity is on the rise. Seen on the runways as well as in the grocery store aisles, it’s a versatile garment that can be worn by almost everyone. The kimono’s comfortable yet simple shape holds so much possibility within it’s easy fitting lines that easily lend themselves to every occasion from holiday to casual. Today’s fun, quick to make kimonos are the perfect canvas for beautiful fabrics and embellished designs. Perfect for those of us who love to sew our own handmade wardrobe! If you’ve never made or worn a kimono or decided they’re not for you, keep reading. I’ve developed an obsessive Kimono addiction that I’d love to share with you! A basic kimono can be cut, sewn, and ready to wear in four hours or less making it an excellent choice for a last minute garment! Most kimono patterns consist of just three basic pieces: front, back, and sleeves. They may be finished with bands around the neck, front, and sleeves or facings. 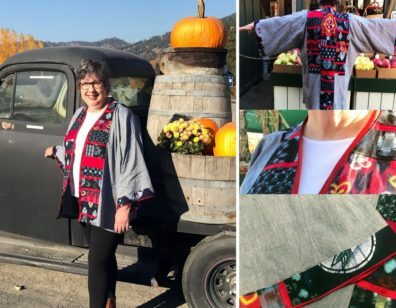 Every handmade wardrobe should contain a comfy kimono – or two – or five! 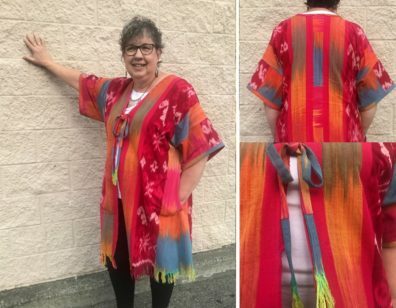 Made from Art Gallery Rayon, this is my shortened Sew Caroline Florence Kimono trimmed with velvet bands. If a Kimono has always seemed like just too much fabric for your comfort level, consider fit and length. 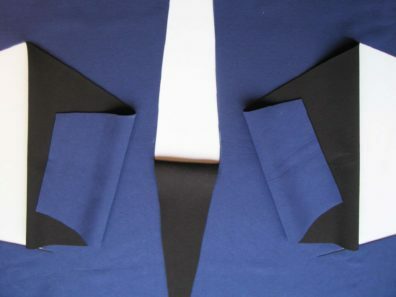 To avoid the boxy sharp rectangles, look for a kimono designed with a slight curve under the arm. 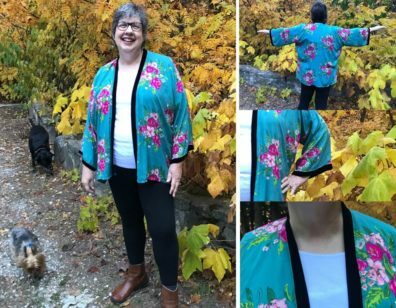 My favorite is the Florence Kimono from independent pattern company, Sew Caroline. Florence has a gently shaped underarm curve that makes all the difference in its flow and fit. It removes the boxiness while maintaining the traditional shape and creates a kimono that is wearable for most of us. When choosing your kimono pattern size, consider how much ease you are comfortable with in a “jacket” or “cardigan”. If you don’t care for lots of drapey fabric on your body style, you may want to make a smaller size than normal. If you’d like more drape, go up a size. Think about your favorite finished length, too. Kimonos can be waist, hip, or knee length, or even longer. With your fabric choice in mind, consider the sleeve length that will be most flattering for you. For a super-quick Spring or Summer sew, leave the sleeves off so your kimono can easily be thrown on over a t-shirt or swimsuit. My “Pumpkin Spice” Kimono. Stitched from Indygo Junction’s Contemporary Kimono pattern using a Yukata cotton panel and Japanese cotton purchased at the Sewing & Stitchery Expo. The rectangular pieces used to create the traditional t-shaped Kimono were originally designed for 14” – 16” Yukata fabrics. Light to medium weight fabrics like silk, rayon, chambray, linen, cotton, tencel, velvet, lace, knits and sweatering are all fabulous choices for today’s kimonos. The simple shape is also perfect for maintaining the integrity of a large print or other fabric you “can’t stand to cut into”. The large pieces that make up a kimono will compliment your fabric’s design and show off the print, stripe, or weave beautifully! Kimonos are and amazing canvas for embroidery, applique, beading and all forms of embellishment. Use your creative skills to add interest to the back, front, or both. Embellish the front and sleeve bands with applique or pieced fabrics. Add lace or machine embroidery to the shoulders for a surprising pop of gorgeousness. And, don’t forget the edges – they’re perfect for fringe. Whatever you choose, you’ll make a unique statement of your own talent and fashion style! Top a Summer tank and skirt or shorts with a kimono and add your favorite sandals. Carry your kimono to the beach for a swimsuit cover-up with instant style. Go Boho with a long kimono worn over wide leg jeans, a t-shirt and a floppy hat. Add a kimono to your Summer dress or Winter LBD and create an ensemble. Change your kimono’s silhouette by adding a belt or tying the fronts in waist high knot. Dress up your kimono with stunning jewelry and add a cross-body bag for shopping trips. Another Sew Caroline Florence Kimono, stitched and pieced with Japanese Indigo fabrics and Chambray. The Japanese fabrics were purchased at the Sewing & Stitchery Expo. 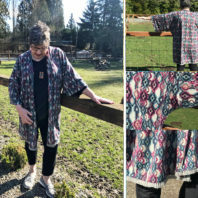 Although it’s often thought that we can’t save money sewing our own clothing, the kimonos shown on the Johnny Was web site will make you think differently. Ranging in price from $300 to $800, these simply shaped jackets are stitched from luxury fabrics and embellished with embroidery and applique. All things that are readily available to those of us who enjoy sewing our own handmade wardrobes and at a much lower price! While attending the Sewing & Stitchery Expo this year, plan time for a trip to Bellevue, WA to visit their store and collect loads of inspiration to recreate on your own! I’ve been blogging about my journey into kimono obsession on my own blog, The Sewful Life. For more details about the kimonos I’ve made, hop over there and search for “Kimono” on the right hand side. You’ll find five blog posts about the kimonos I have known, sewn, and thoroughly love! 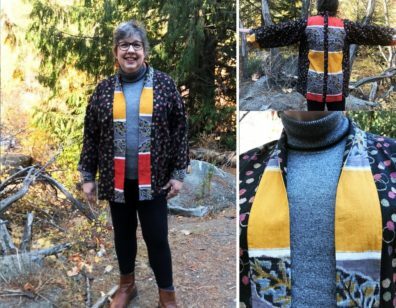 About the Author: Annette Millard recently started her own blog, The Sewful Life, which utilizes her sewing and teaching experience to provide helpful tips and tricks, tutorials, and project ideas. Visit the blog at sewfullife.com and be sure to say “hi” at Expo in one of her classes! View the class catalog to learn about the classes Annette will be teaching in 2019. I started sewing when I was five, learning to make everything I wanted the way I wanted it. From doll clothes to Halloween costumes, to prom dresses, even my own wardrobe in high school and college that fit me perfectly. But it wasn’t until I had a child with sensory processing disorder and Asperger Syndrome that sewing became more than just a part of my everyday life. It became a gift I could give my son. If you know children (or adults) who have sensitivities or special needs of any kind, you will undoubtedly nod in acknowledgement when anyone speaks of cutting tags out of shirts and pants, wearing socks inside out so the seams don’t touch the toes, and an outright refusal to wear jeans. For my son Peter, the difference between a good day and a call-mom-at-work-to-pick-up-the-child day was almost exclusively down to the clothes he wore. After my otherwise mild-mannered child had a giant temper tantrum over an orange shirt, I realized I needed to pull out my sewing machine to help him. It wasn’t the color of the shirt that was the problem. The problem was that the thickness of the fabric caused the overlocked interior seams to be very bulky, therefore not smooth on the inside. The seam itself caused him such distraction, he had no attention left over to tolerate any other irregularities or external input, hence the overwhelm and subsequent meltdown. I was only able to discover the underlying issue because he was a highly verbal child at three years old. Imagine how much more difficult it is to interpret the cause of sensory overwhelm in a nonverbal baby or child (or nonverbal adult, for that matter). The solution, as is often the case, was far simpler than the problem. I just needed to make him the smoothest possible seams in every piece of clothing he wore. 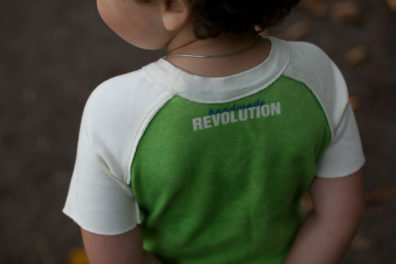 Eighteen years ago, we couldn’t find tagless t-shirts or raw-edged sweats at the store, so I learned to make the most comfortable little boy clothes I could imagine. These turned out to be the “secret pajamas” on which I would later base my entire sewing philosophy. I only bought fabrics that would wash well and not pill in the dryer because those little balls of polyester fleece were irritating to my boy’s little legs. 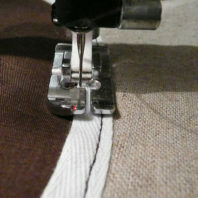 I started to sew his shirts inside out, tacking down the seam allowances with an additional line of stitching. 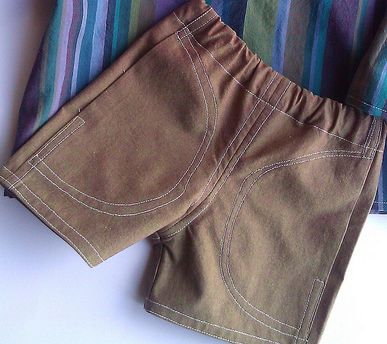 I sewed strips of thin polar fleece inside jeans to flatten and soften the seams. I even stitched the pockets to the front of his trousers with soft twill tape so they wouldn’t flop around or bunch up at the side seam. I learned to remove tags from those t-shirts he really wanted from the store and sew an extra binding on the inside back neck if I couldn’t completely remove the tags and paper or rough ribbon remained. Between the extra special clothing and occupational therapy, my son transcended his sensory issues and thrived in school and beyond. He’s now a completely independent successful adult, going to college, working full-time, and living in his own apartment without giving a second thought to his clothing. When we make clothes for ourselves and others, paying special attention to their specific needs and considering comfort as much as style we truly give a gift that can affect their experience. Over the years, I’ve been able to help children who would otherwise collapse with sensory overwhelm live normal kid lives. About the Author: Karen LePage has written books about sewing for children and adults. She is the indie designer’s patternmaking secret weapon, and has taught video and in-person classes to anyone who would listen since 2008. 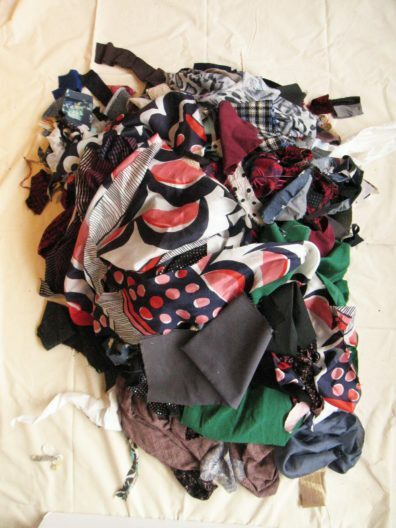 She believes that sewing clothes is a radical act of self-love. For more information and a demonstration of specific techniques, please join Karen in class 1926 Sewing for People with Sensitivities. Sign up at sewexpo.com when the ticket office opens. Also be sure to visit her blog One Girl Circus to learn more about Karen’s experiences and how you can adopt similar philosophies when sewing for others.